HOW FAR IN THE GOLF CART TO THE BEACH.....34 SECONDS..
HOW FAR IN THE GOLF CART TO THE MARINA....28 SECONDS..
JUST COMPLETED - KITCHEN REMODEL WITH GRANITE AND MASTER BATH HAS JUST BEEN INSTALLED. GREAT PLUS - Bamboo hardwood floors in master bedroom, , , ceramic tile in baths. But you ask, 'what's Fripp Island like??' It's a beautiful, private resort sea island set up for quiet, relaxing FAMILY vacations. At Fripp, the beaches are never crowded and you can be certain your kids will have a great time. Our Sea Foam Green Bonito Drive Bungalow is located in the heart of Fripp Island's Ocean Creek neighborhood, which includes 4 swimming pools, the Cabana Club with the tropical-themed pool complex and Davis Love's Ocean Creek golf course. Take one or both of our 4 person complimentary golf carts to the beach, golf courses, tennis courts, marina and Veranda Beach pool complex, or just cruise around the island. No matter where you go, Ocean Creek has all the fun amenities for you and your family to enjoy during a quiet, relaxing vacation. The house sits on the 17th fairway of the Ocean Creek Golf Course. At one end of Bonito Drive is the beach, usable at low tide. The Marina is at the other end. We are about halfway between the beach and the Marina. Boat owners, bring your boat and have the Marina launch it. In the evenings, don't forget to relax on the rear master bedroom porch. Turn on the ceiling fan, ease into the rockers, freshen up your beverage of choice and watch the sun set over the marsh. This is why you decided to vacation on Fripp. Quiet, relaxing lowcountry beauty, all at your fingertips. The house offers extras like hardwood floors, plantations shutters, a gas fireplace, outdoor shower and a jetted master tub. And don't forget, we provide you with 2 free golf carts, 2-4 island cruiser bikes and 4 beach chairs during your stay. It's our small way of thanking you for selecting our bungalow for your vacation. The large great room leads out onto a rear screened deck, with back yard access, overlooking the golf course, marsh and creek. The bedrooms are set up as a king master suite with a jacuzzi bathtub, seperate shower and cable TV/VCR, a queen bedroom with a full bath and cable TV, 2 twin beds, one roll away bed (which fits nicely in either upstairs bedroom) and a queen sleeper sofa. This is a non-smoking house. Pet friendly with details on your dog with your inquiry. Effective May 1, 2007 - South Carolina Sales Tax increased to 6%, Accomodations Tax is 2% and Beaufort County Sales Tax is 3%. Living in Matthews, NC and in the Real Estate Business. My wife and I have been great lovers of Fripp. Great friends there. 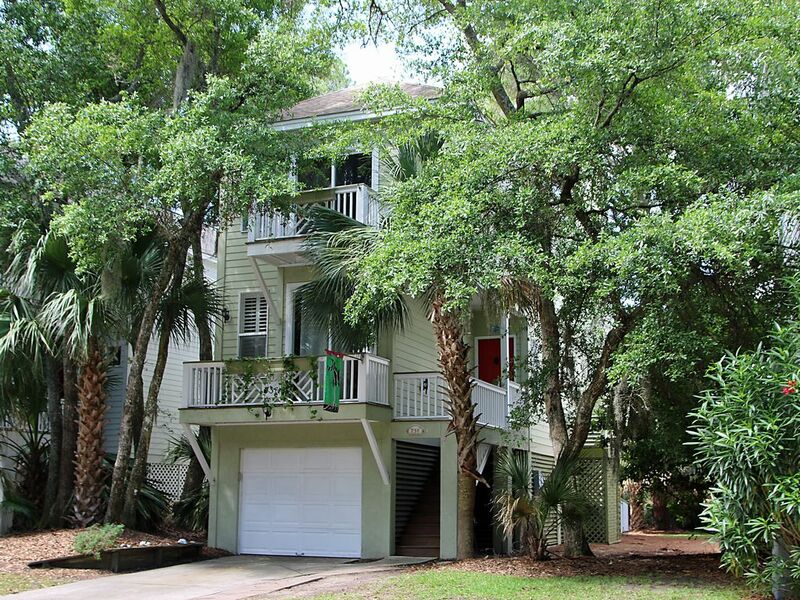 This is one of two houses we have at Fripp and have enjoyed great guests and friends we meet there. It is a fantastic location. In the middle of all the action and yet when you walk out back a great view/and quiet location. Great layout for families and all the amenities that are great for an easy stay. 2 golf carts make the stay easy and bikes are also available. You are staying worry free. This home has it all. We have upgraded this unit to make sure that your vacation takes care of everything. People ask me...how far to the beach...well..by golf cart it's 34 seconds...they also ask me...how far to the marina....it's 28 seconds. How great is that. Note that we provide at least 2 bikes but usually try to have 4 available. VCR/DVD, Two 4 person Golf Carts (a $700 value vs, renting 2 carts thru the resort), 2 to 4 island cruiser bikes (as available), 4 beach chairs (as available). If you bring a dog....owner must approve.